Citation: Curcuma aromatica Salisb., Parad. Lond. t.96.1807; Hook. f., Fl. Brit. India 6:216.1890; Gamble, Fl. Pres. Madras 1483(1036). 1928; Manilal & Sivar., Fl. Calicut 286. 1982; Mohanan, Fl. Quilon Dist. 405. 1984; Ansari, Fl. Kasaragod Div. 378. 1985; Sabu, Taxonomic Phylogenetic Stud. Zingiberac. 209. 1991; Mangaly & Sabu, Rheedea 3: 145. 1993; M. Mohanan & Henry, Fl. Thiruvanthapuram 473. 1994; Sasidh., Fl. Periyar Tiger Reserve 447. 1998; Sasidh., Fl. Parambikulam WLS 342. 2002; Mohanan & Sivad., Fl. Agasthyamala 709. 2002; Sabu, Zingiberaceae and Costaceae of South India 141. 2006; Sunil & Sivadasan, Fl. Alappuzha Dist. 685. 2009; Ratheesh Narayanan, Fl. Stud. Wayanad Dist. 862. 2009. 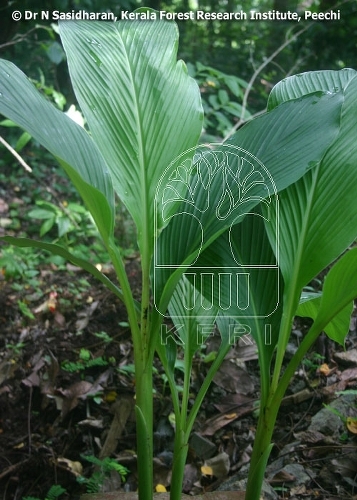 Description: Pseudostem with leaves 90-120 cm high; rhizome orange yellow inside. Leaves to 65 x 20 cm, elliptic, acute at either ends; petiole to 30 cm long; ligule membranous, obtuse. Spike 15-17 x 7 cm; crown purplish blue; bracts 4 x 3 cm, orbicular or obovate, yellowish green, tomentose. Flowers brownish-yellow; calyx 1.5 cm long, lobes obtuse, corolla lobes 1.2 x 0.8 cm, glabrous, brownish; anthers 4 mm long; tail 3.5 mm long, divaricating; lip yellowish, 1.5 x 1.5 cm, shallowly 3-lobed; midlobe emarginate; lateral staminode 1.2 x 1 cm.